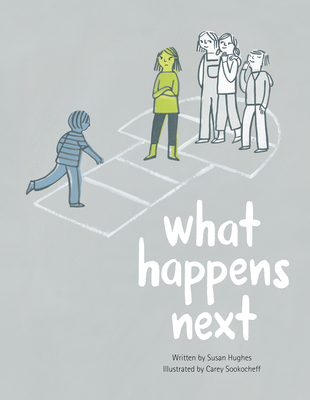 What Happens Next is a raw, realistic story told by an unnamed protagonist who is made to feel different from everybody else--even invisible sometimes. Bullied by a girl at school, our narrator gives a terse script of the related facts (What Her Friends Do: Laugh. What Everyone Else Does: Nothing.) and emotions (How I Feel Sometimes: Bad. Really Bad.). The narrator takes these hurt feelings home, where Mom listens and offers some ideas. At school the next day, the child confronts the bully by turning a "weirdo" fascination with science into an opportunity to find common ground, and maybe help the bully see the world in a new way. Spare illustrations in a limited palette of blues and greens convey feeling alone even in the hustle and bustle of a crowded schoolyard. Graphic novel-style panels set a steady pace for the emotional impact of this important story that doesn't simplify the realities of feeling like an outsider. It's a powerful starting point for discussions of emotions, empathy, and how we relate to others.